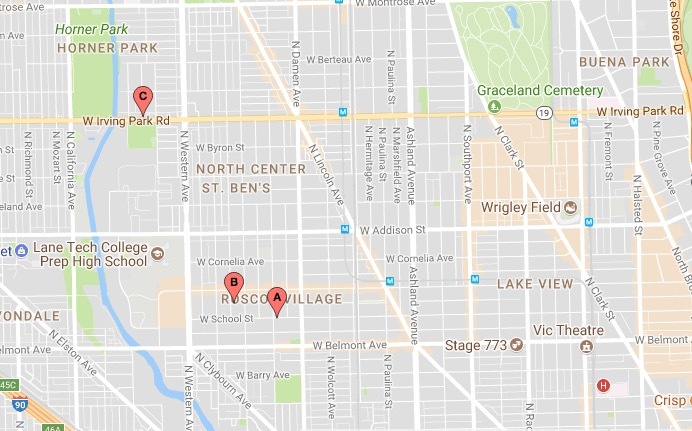 Two masked offenders approached an Uber driver, implied they had a handgun and forced him out of his car in North Center yesterday evening. The victim said it all played out near the intersection of Irving Park Road and Maplewood around 9:30 p.m.
Taken was a white 2015 Honda Civic with a license plate that begins with Z683, police said. The offenders tossed the victim’s phone out of the car in the 4300 block of North Spaulding, about a mile west of the crime scene. Police said the suspects are two black men between 19- and 25-years-old. One is 5’8” tall, 190 pounds, and he wore a puffy black jacket with dark jeans. The other is also about 5’8” tall, slimmer, and he wore a white and red hoodie with black jeans. Both men covered the lower half of their faces with masks or scarfs. Last night’s carjacking is the third in the North Center-Roscoe Village area since Tuesday night. Read more about the earlier incidents HERE. Neither car taken on Tuesday been recovered as of late last night, police said.